We like homes to be as individual as the people who live in them. People use different rooms in different ways, and the kitchen is the best example of this. Some clients prefer a kitchen that is sleek and beautiful, but know they won't use it for much more than light cooking. For other clients, the kitchen is the heart of their home -- a functional, working space for cooking and gathering with family and friends. If this resonates with you, we would suggest a robust species like Hickory, Acacia, or Birch -- these are kitchen hardwood floors that can stand up to anything! We like rich finishes that mirror the warmth of family, and accent colors that compliment cabinetry. Cabinets and hardwood kitchen floors that look the too similar will make the room feel heavy and flat. You want your cabinets and floors to work together, yet they should be different enough to define the various planes of the room. We like our clients to have kitchen hardwood floors that are vibrant, beautiful and durable. 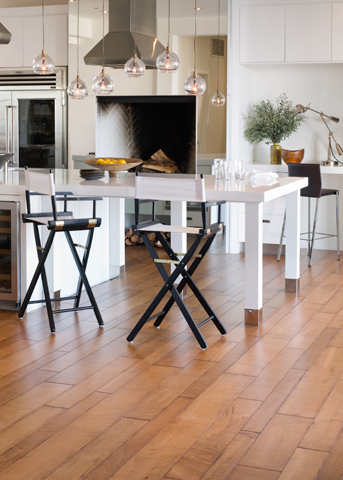 If you have questions about which hardwood floors would match your kitchen, give us contact us.